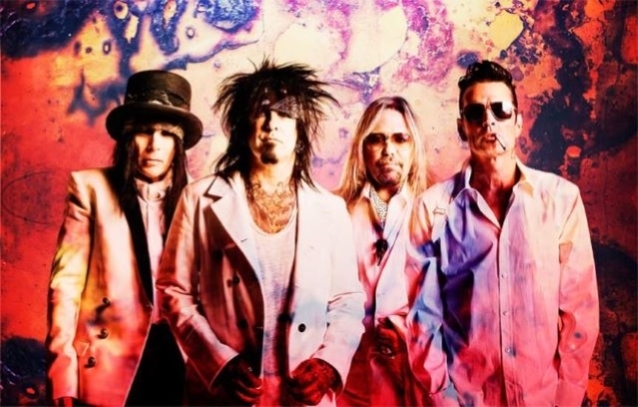 MÖTLEY CRÜE has collaborated with Machine Gun Kelly on a song that will be included in the soundtrack to the film adaptation of the group's biography, "The Dirt - Confessions Of The World's Most Notorious Rock Band". The rapper — whose real name is Colson Baker — plays MÖTLEY CRÜE drummer Tommy Lee in the movie, which will premiere on March 22 via Netflix. "The Dirt" also stars Daniel Webber ("The Punisher") as singer Vince Neil, Douglas Booth as bassist Nikki Sixx and Iwan Rheon ("Game Of Thrones") as guitarist Mick Mars. At the end of last year, the members of MÖTLEY CRÜE reunited with longtime producer Bob Rock to record four new songs for the soundtrack. In a Twitter question-and-answer session Wednesday night, Sixx was asked if Machine Gun Kelly would guest on one of the songs, to which he answered: "Yes. New song with MGK is coming really soon." Asked to describe the new MÖTLEY CRÜE music, he answered: "Heavy Crüe…"
"The Dirt" was helmed by "Jackass Presents: Bad Grandpa" director Jeff Tremaine. It was picked up by Netflix after being previously developed at Focus Features and before that at Paramount. Machine Gun Kelly told Billboard that he got his part in the movie after "a six-audition process. The first two, I was auditioning for Nikki Sixx, and then the last four for Tommy Lee, over the course of two and a half years," he said. To cement the sense of finality, the four members of MÖTLEY CRÜE in 2014 publicly signed a "cessation of touring" contract that prevents any of them from performing under the CRÜE name in the future.